St. Joseph's Church, 7 - 8pm, Presentation on the Harry Clarke windows by Dr. Nicola Gordon Bowe, with organ music by Peter McBride, more details here. Terenure Sports Club, 5-11pm, local historical presentation, exhibition, puppet show and more! Paul Howard, creator of Ross O'Carroll-Kelly, will also be discussing his relationship with Terenure. Free, but booking essential, tickets available from Terenure Sports Clubhouse (formerly CYM), Terenure Road North. More details here. Unfortunately the event at Rathfarnham Castle has had to be cancelled. Terenure Couples who Bought Their Home, or are Trying to - Can You Help? The Irish Independent are preparing a feature on Irish attitudes to property over the generations. The writer would like to speak to couples who bought a home in Terenure from the 60s, 70s, or more recently in the 2000s....as well as a young couple today who ideally would like to buy in Dublin but who are just finding it too expensive. They can also tell him why it's such a great area to live! Interviews would be over the telephone and it should take no more than 15 minutes. 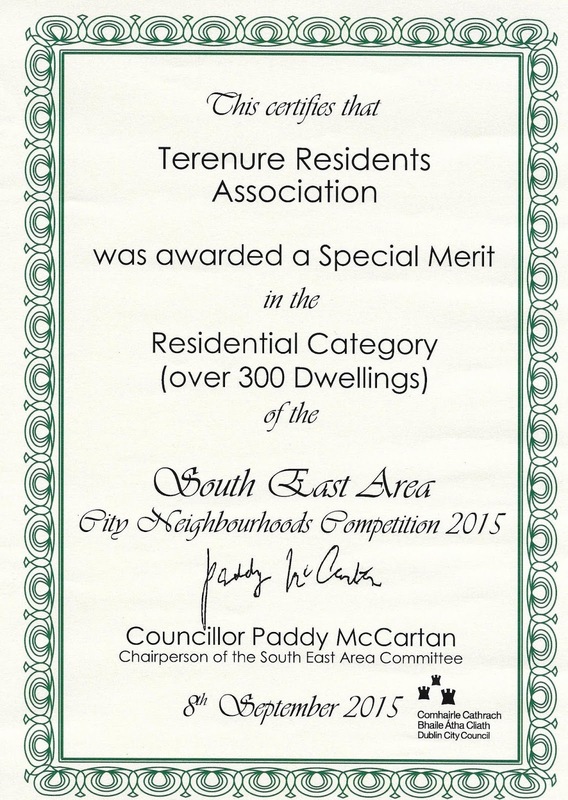 Terenure Residents Association was awarded a Special Merit in the Dublin City Council (South-East Area) City Neighbourhoods Competition 2015 - Residential Category (over 300 dwellings). 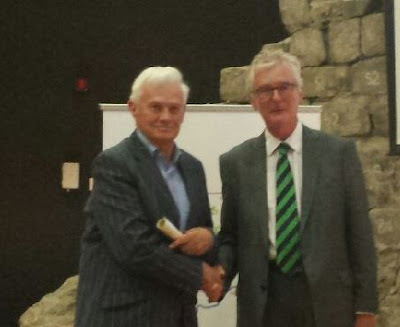 The award was presented by Councillor Paddy McCartan and received on behalf of the association by Jim Dowling (TRA committee member). 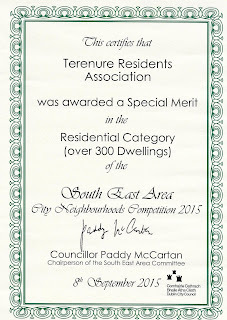 Terenure 2030 won several awards. Terenure Office Supplies received an award for the best shop front. At 9am this morning Aldi in Terenure opened its doors to the public for the first time. Situated in the former tram sheds on Terenure Road East, the building retains the outline of the former sheds, finished in recycled stone from the original building. Beneath the store an underground car park can accommodate over 80 cars, and by 9.45 this morning was already full. The Association welcomes new commercial activity that benefits residents and also the regeneration of formerly empty and dilapidated buildings. However we retain reservations about the effect on traffic in particular, and also pedestrians crossing the entrance slip road, and will monitor this situation carefully. Should you have any comments or observations on these issues please get in touch.